This article addresses fearful dogs, but not dogs who will automatically go into attack mode at the sight of a stranger!! If you live with a dog who displays this behavior, please contact a professional in-home behaviorist/trainer to work on this issue! The dogs I will be describing below are dogs who choose a flight response when faced with fearful stimuli. Since I’ve been training dogs professionally, I’ve come to realize that we humans often exacerbate our dogs’s behavior problems. One thing that most of us do is allow our fearful dogs to run wildly to the front door when the doorbell rings. By the time we arrive at the door to answer it, our dogs are already in such a lather that they can’t think straight! We’ve actually taught our dogs to behave this way because we wind up rushing to the door in an excited state, and our dogs have picked up on this. Then we compound the problem by opening the door and holding the dog back by grabbing his collar to avoid having the dog either jump on, lunge or attack whoever is standing on the other side. We’re now causing our dogs to feel completely frustrated because we’re preventing them from investigating what’s on the other side of that door. Doesn’t this sound like a situation out-of-control? Well… it is. During one occasion, I was to train a fearful Shih Tzu who was always spooked when anyone arrived at the house he didn’t know. When I rang the doorbell, the owners opened the door, picked up their dog and attempted to hand him to me! Yikes! The dog was already scared out of his little mind, and now his humans were trying to push him into the arms of a person he thought might want to harm him. 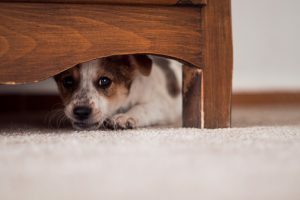 So, let me offer some suggestions on how you can create a less stressful way of introducing your shy or fearful dog to a visitor at your home. 1. Do not make eye contact with the dog. 2. Do not speak to the dog. 3. Do not reach a hand toward the dog. 4. Do not try to pet the dog. 1. Begin slowly and quietly dropping treats on the floor for the dog to eat (provide soft and very tasty food treats; e.g., cheese, bits of lunch meat, freeze-dried liver, bits of garlic chicken, bits of hot dogs, etc.). If the dog does eat the treats, you can be relatively certain that his stress levels are lowered. If he chooses not to eat, he is still quite nervous. 2. If the dog is eating, after a few minutes, tell the visitor to put a treat in an open palm and put that hand down by their side. If the dog eats the treat from this person’s hand, you’re probably on your way to a good introduction. 3. Once the dog is accepting hand-fed treats, your visitor can start to speak softly to the dog. Your visitor can begin looking at the dog, but not directly in the eyes. *You* be the judge as to whether your dog should continue staying in the room with this person for the duration of the visit. If your dog seems to be relaxing and gaining trust in this person, that’s a very good thing. If your dog starts to back away from this person, it would probably be best to give him a break in that safe room you’ve created for him. He can always come back out in a little while for a re-introduction. 4. For first-time visits with anyone, I would suggest that you not encourage petting. Sometimes I don’t pet a dog until I’ve worked with him 3 or 4 times. Petting is not always seen by every dog as rewarding! When dogs are fearful, they may resort to nipping a person for trying to touch them. You always want to avoid having your dog practice any inappropriate behavior with anyone. Each time he’s allowed to practice inappropriate behaviors with people, he’s learning to strengthen those bad habits. Both you and your visitor should praise him to the skies for showing friendly behaviors. 5. Instruct your visitor to not get up without first telling you that they’re going to get up. If someone wants to get up or leave the house, *first* call your dog over to you, and take him into another room. Keep him facing *you* and get his attention focused on you! Get his attention by feeding him those delicious treats continuously until the person is gone. Nervous dogs generally get nervous again as soon as the stranger stands up and moves around. That’s probably because the dog doesn’t know what this person is going to do. If you make a practice of feeding your dog when people leave, he’ll again begin to change his association of that behavior from negative to positive because of the prediction of food happening. Be patient! This will not happen overnight! Depending on your dog’s age, his past learning experiences, and his overall temperament, this could take a couple of months or it could take a year or more.